Koulourakia are traditional Greek Easter cookies that are infused with orange zest and perfect for dunking in coffee. Use baking ammonia for a fully authentic cookie! One of my very favorite things about each and every holiday is uncovering new-to-me food traditions. I’ve heard about Greek Easter cookies (officially knows as Koulourakia) before, and they finally made their way into my kitchen. My husband and I, while Italian, have a love affair with Greek food, as well. We had moussaka on one of our first dates, we love spanakopita and baklava, and my husband just requested Greek custard pie for his birthday dessert. These cookies are firm yet tender, orange-flavored, and reminiscent of of a soft biscotti. They are perfect for dunking in your morning coffee or afternoon tea (or evening coffee!). 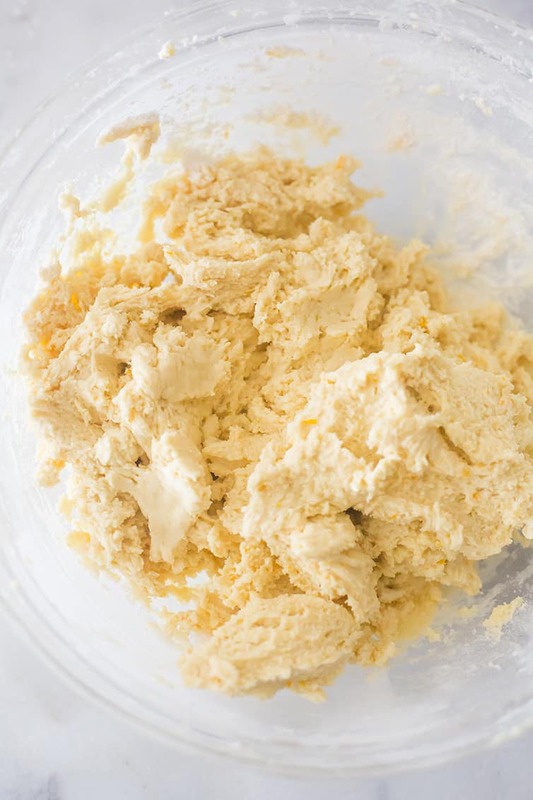 I started the dough with one of my very favorite tricks that I picked up probably 10 years ago from Dorie Greenspan’s Baking: From My Home to Yours… when making something that involves citrus zest –> rub the zest into the sugar! It totally infuses the sugar with the flavor of the zest, which has a more dramatic effect that simply mixing the zest into the dough or batter. I do this every.single.time I make a recipe with citrus zest and I love the results. What is the Tradition Behind Koulourakia? Koulourakia are a traditional Greek cookie, typically made the week of Easter, to be eaten after Holy Saturday. They are a butter-based cookie, and are hand-shaped in a variety of designs, topped with an egg wash, and sometimes sprinkled with sesame seeds. They are most commonly infused with orange and vanilla flavors. Wait, What Is Baking Ammonia? 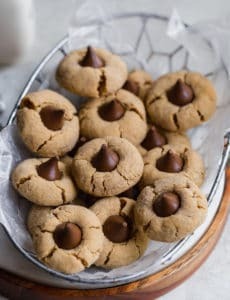 When I started researching Greek Easter cookies, I found that many of the old-school, really traditional and authentic recipes called for baking ammonia as the leavening agent, instead of baking powder and/or baking soda. After some reading, I discovered that baking ammonia was used wayyyyyy back before baking powder or baking soda were “invented”. It is still somewhat common in Mediterranean baking, and can be found in some Greek markets and ordered online. It is typically used in baked goods that have a low moisture content and bake up firm and crisp or crunchy. Baking powder can be used interchangeably with baking ammonia, but the baker’s ammonia does produce a lighter, crunchier crumb. And it does have a strong odor (it used to be used as smelling salt! ), but it dissipates during the baking process. I’d love to hear about your favorite Easter food traditions! Do you have special cookies, bread, or other foods that you make year after year? Share them in the comments below! And if you’re curious (or making your Easter menu! ), feel free to browse through all of my Easter recipes. I hope you find some new recipes that you’ll love! 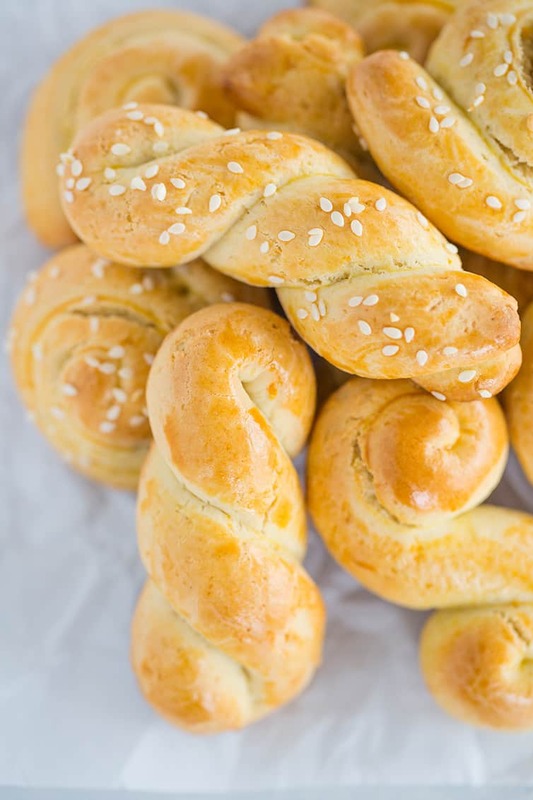 Want to Make Greek Easter Bread (Tsoureki), Too? I’ve got you covered! Years ago, I made a Greek Easter bread that was to-die-for… a sweet bread also flavored with orange and adorned with colored Easter eggs, you can find my recipe here >> Greek Easter Bread (Tsoureki). 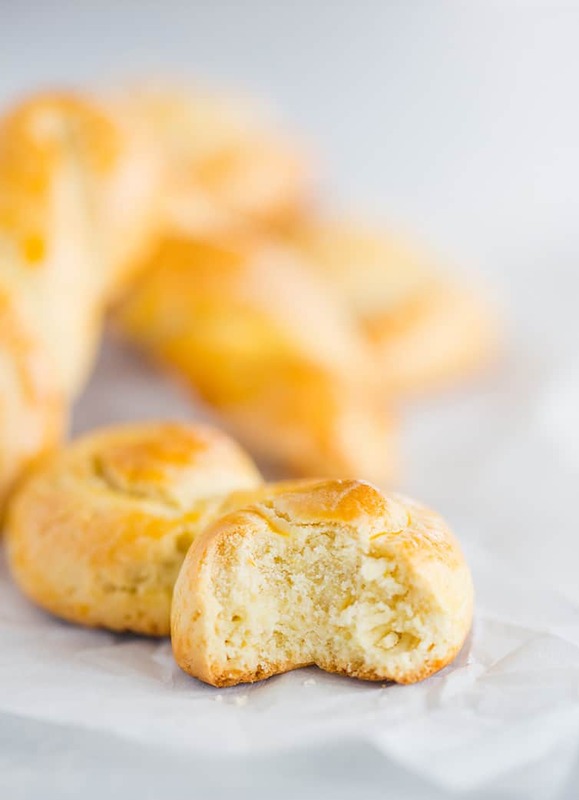 Koulourakia are traditional Greek Easter cookies that are infused with orange zest and perfect for dunking in coffee. 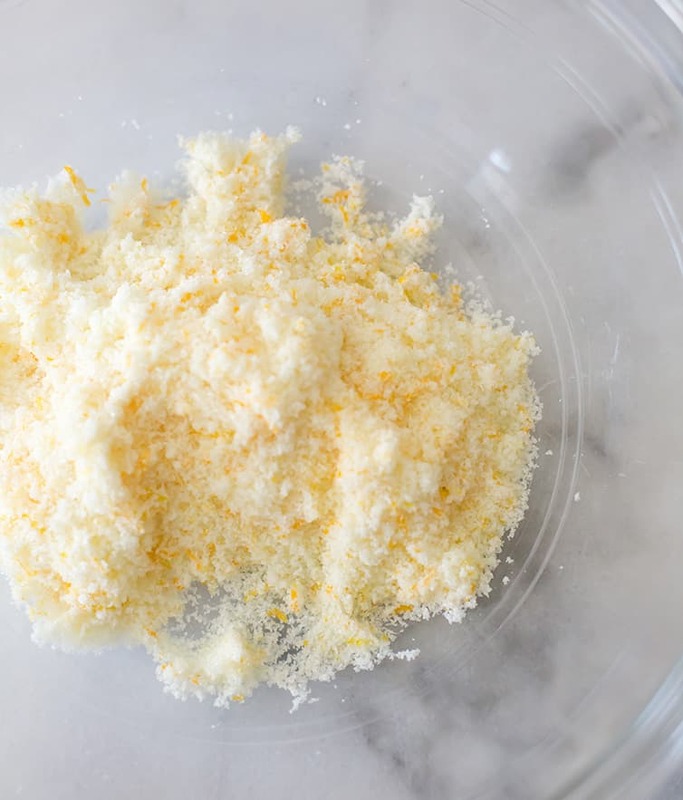 In a large mixing bowl, use your fingertips to rub together the sugar and orange zest until all of the sugar is evenly moistened with the zest. Add the butter and beat on medium-high speed for 5 minutes, stopping to scrape the sides of the bowl occasionally, until the mixture is pale, light and fluffy. Add the eggs one at a time, beating for a full minute on medium speed after each addition. Add the milk and vanilla extract and beat to combine. Sift the flour, baking powder and salt into the dough a little at a time, and beat on low speed until just combined. Use a rubber spatula to give the dough a final mix and incorporate any pockets of flour. The dough should be soft, but not sticky. Cover with plastic wrap and allow to rest for 20 minutes. Preheat oven to 400 degrees F. Line two baking sheets with parchment paper or silicone baking mats. 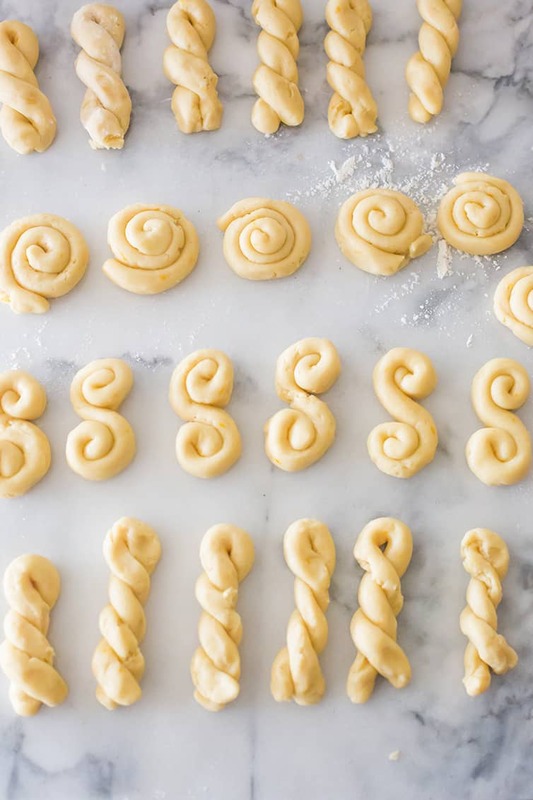 Using about 2 tablespoons of dough at a time (or a medium cookie scoop), roll the dough into 7-inch ropes and then shape as desired: braids, circles, pinwheels, "S"s, etc. Place at least 2 inches apart on the prepared baking sheet. In a small bowl, whisk together the egg yolk and water for the egg wash. Brush over the shaped cookies. Bake, one sheet at a time, until golden brown, about 20 minutes. Allow to cool on the baking sheet, then store in an airtight container for up to 2 weeks. I have not made these cookies yet. However, when I printed the recipe the first two ingredients are blank. I went back to the online version to see what was missing. It is the sugar and orange zest ingredients that do not print out. Not sure if any other viewers had this experience. Thought you may want to know this to see if maybe it is something to do with the color of the font. Thank you. Your “Greek” recipes are on point! I’ve viewed kouroulakia and galatoubouriko. Looking forward to viewing your others. The galatoubouriko is identical, and the kouroulakia is nearly identical to what I use, but I use no milk and just orange juice. PUT THE COFFEE ON ! I usually do the yeast baking and my wife does cookies and cakes. When I saw these I knew I had to try them. Way back a wonderful Greek women made these and always shared them. Greek Easter is the 8th this year so I’m right on time. They came out great with just the right amount of sweetness. Have to watch the bottoms since first batch got a little dark, but still a fantastic cookie. First recipe from your site but I’ll be looking around. I think ciabatta is next. These cookies have officially been added to our Easter traditions! They are simple to make, taste delicious, and great for little hands to help and get creative. The “H” is for our new grandson Henry who will be experiencing his first Easter. I used sesame seeds on some and sparkling sugar on some and then just left some plain. Thank you for sharing this recipe. Happy Easter!!! These cookies are really good. The only change is 425 grams is actually equal to 3 1/2 cups of flour. They are easy to make and definitely recommend. They’re better than bakery cookies. 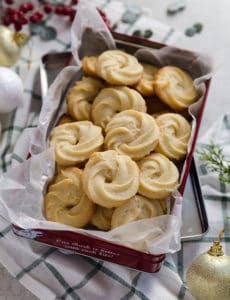 They remind me of Stella d’oro Roman egg biscuit cookies. I grew up in a Greek home. 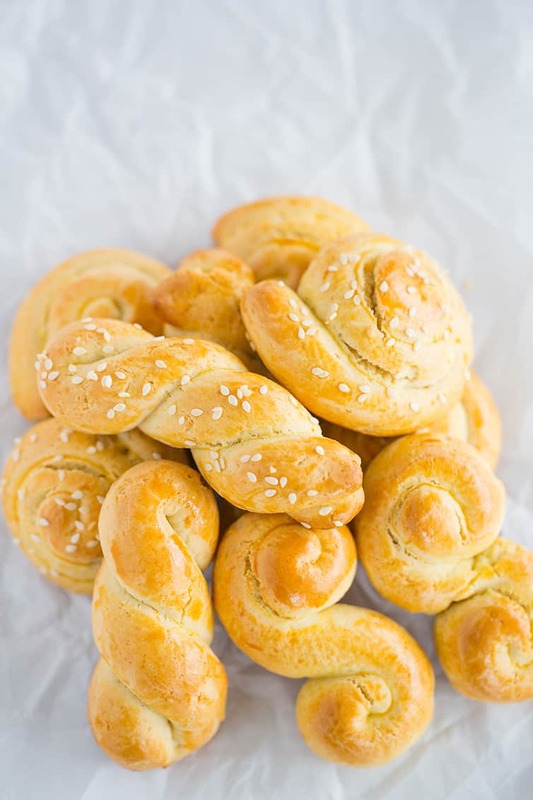 My mother made koulouria the traditional way when I was very young. We found that cake flour works beautifully in place of all-purpose. Koulouria have become a holiday staple in our home. Btw, they freeze nicely for a treat with tea after the holidays. I’m also fond of Greek food and Galaktobureko is my favorite Greek dessert. I’m going to try these cookies. I loooove most things Greek however I’m not fond of these cookies (I love Kourambiedes though!). What thrilled me here though was the link to Galaktobureko (Greek Custard Pie) which is my favourite Greek dessert! I will accept Bougatsa which is similar and more common in Greek restaurants in Canada but the syrup on Galaktobureko just takes it to another level. I haven’t worked with phyllo for a looooong time but I may have to give this review a try. Thank you! PS a recipe for Kourambiedes would be great if you’ve got one. 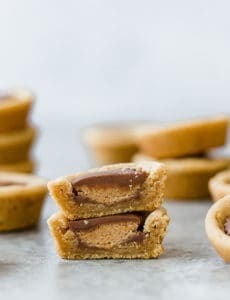 Hi Wendy, I’ve never made Kourambiedes myself, but am going to add them to my Christmas baking list! I can send you my Grandmother’s recipe for Kourambiedes if you want. I will be trying the Koulourakia this weekend. Thanks. I made cookies with baker’s ammonia a few years ago and I believe that I was able to get it at the Walmart pharmacy. You have to ask for it at the window.